Located in the geographical center of the state, Berlin is best known as the Home of the Yankee Peddler. The first white settler, John Beckley, arrived in 1650, followed by a few families from Farmington in the late 1600s. Initially, Berlin was both a religious and an agrarian community. Farming was the way of life when the first church was built in 1712 in the Great Swamp Settlement of Berlin. As the settlement grew, small industries arose, mills sprang up along the rivers and streams, tinsmith shops opened, and the Yankee peddler wagon became a traveling store. Gradually over the years, the industries expanded and the farms diminished. 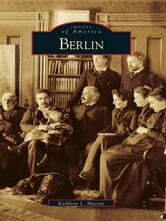 Berlin focuses on the townspeople-the doctors and merchants, artists and artisans, poets and painters. The town has three population centers: East Berlin is separated from Kensington and Berlin by a highway and a line of hills, and each of these sections has retained its villagelike atmosphere. The book highlights the diversity of Berlin's religious community and the spirit of ecumenicalism that spread throughout its neighborhoods. Individuals who appear include the Leatherman, a gentle person who traveled through Berlin in ages past, and the Goat Man, the personification of the kind neighbor. Dr. Willard Wallace said it very well, "Berlin is just Berlin . . . people of many different religious and ethnic backgrounds who live successfully together."